Over the weekend, we ran out of milk and eggs, so I didn’t have ingredients to make breakfast today–egg omelets, French toast, pancakes, or cereal all require either eggs, milk, or both. When JJ asked “What’s for breakfast?” I said, “Donuts….Duh!” I am such a good Mom. LOL. The beautiful card my friend made me. Actually, I was headed into town anyway and planned to stop and buy them then. EJ went with me, and our first stop was to the post office to pick up our mail. (Our village is so small that all residents have post office boxes.) In my box was a homemade birthday card from my friend. 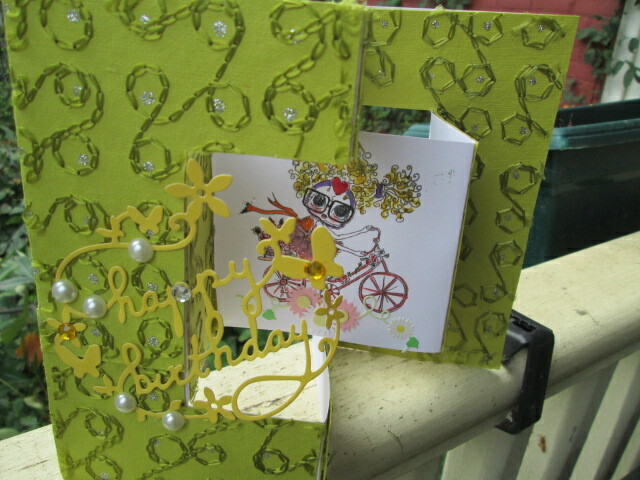 She makes the most beautiful cards. She’s sent cards to JJ and me throughout the winter while JJ was having Chemo. We always looked forward to them. The Postmaster saw me getting my mail so he came out behind the counter to wish me a happy birthday. He even sang a few lines of the Happy Birthday song. I thought that was really sweet. There are advantages to living in a very small town. Our next stop was at the veterinarian. Luke has been losing weight and hair and throwing up. Luke has a chronic urinary problem (he has to have special food) and I was dreading the possibility that he could be seriously sick or that treatment might be so expensive that we wouldn’t be able to afford it. EJ didn’t think anything seriously wrong, but I tried to prepare myself and JJ for the possibility. I knew that if we had to put Luke to sleep, JJ would be distressed and argue against it. On the way to the vet, I asked God to please let JJ’s beloved cat have nothing seriously wrong. The vet examined him and said that he believed that all that was wrong was that he had developed an allergy to fleas. I haven’t really noticed any flea problem, but Luke did have a couple on him. I hadn’t treated him because I was afraid that maybe he was allergic to his flea medicine. The vet said that Luke was throwing up because he was licking off his hair, which causes agitation in the stomach. The vet weighed Luke and said that he actually had not lost as much weight as it seemed. He gave Luke an injection and also gave us a good flea medication to treat all the indoor cats. Whew! I felt such relief. I think the news that Luke has no major problems is the best birthday gift ever. I actually encountered another problem at the veterinary. Our vet has a “free” cage in the reception area for kittens needing good homes. Several times over the years we have gone to the vet with one cat and come home with two or three. Today there was a six-month old kitten in the cage. EJ sat down on the floor and played with the kitten while we waited to take Luke into the exam room. The kitten was very playful and cute, and EJ kept talking about “bringing home our new kitten.” I kept saying, “No…No…No….No!” We barely escaped without an additional kitten. My homemade chicken pot pie. We stopped at the store and picked up the items we needed. When we got home, I put one of the homemade chicken pot pies in the oven. 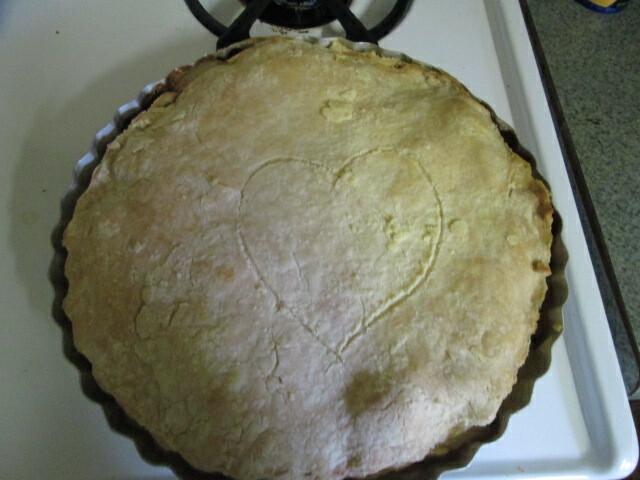 Homemade pot pie is one of my favorite meals and worthy of having on a birthday. We got hungry waiting for the pie to bake, so we had donuts as Hors d’œuvre. When the pie was done, I ate a piece and it was so good that I had another. And then I regretted the second piece because I was so totally full. After EJ left for work, I took Danny for a walk and then talked to my friend on the phone. I also enjoyed all the wonderful birthday wishes I received at Facebook. Birthdays at Facebook are so much fun. Yes, we have four indoor and four outdoor cats. That is quite enough. I think I will have to leave EJ home from the vet next time. 😀 I am glad you are getting cooler weather now. It really is so nice.